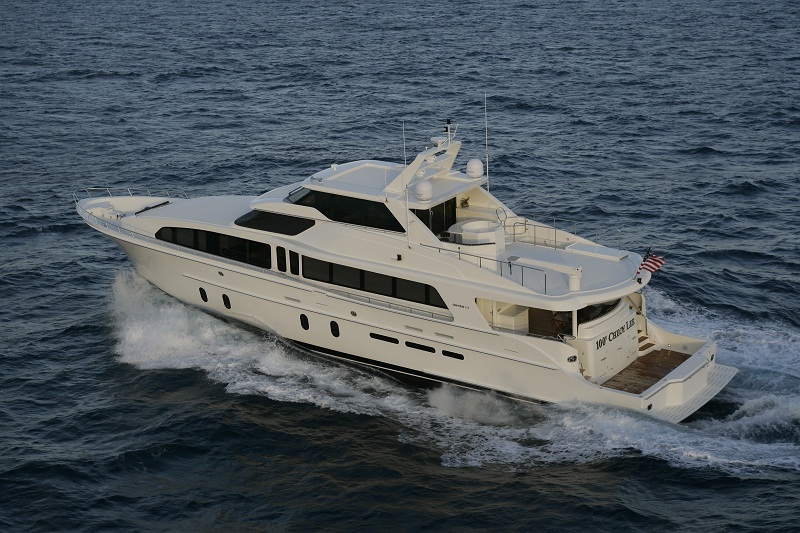 Luxury motor yacht CHRISTINE II is a Cheoy Lee built yacht launched in 2006. 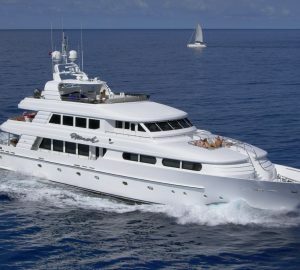 The yacht measures 30,48m (100') and is based in New England, Florida and the Bahamas. 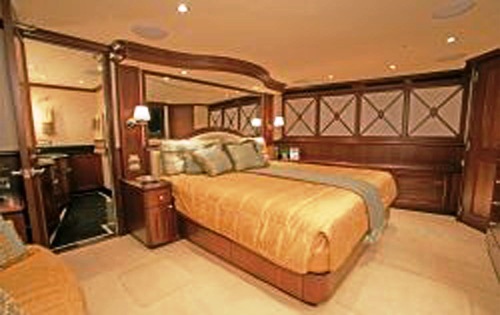 M.Y CHRISTINE II is able to sleep 8 guests overnight in 4 staterooms. 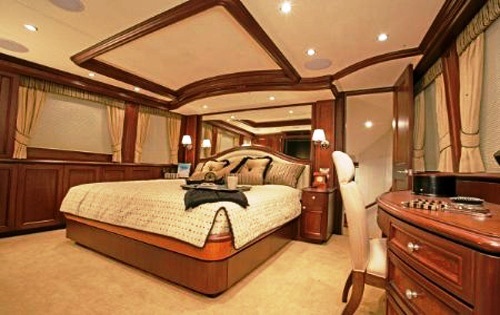 Cheoy Lee motor yacht CHRISTINE II features a very spacious salon with a comfortable L-shaped settee with cocktail table and a large wet bar with an Ice Maker and refrigerator. Further forward there is a circular dining table that seats 8 comfortably and a dining buffet unit. 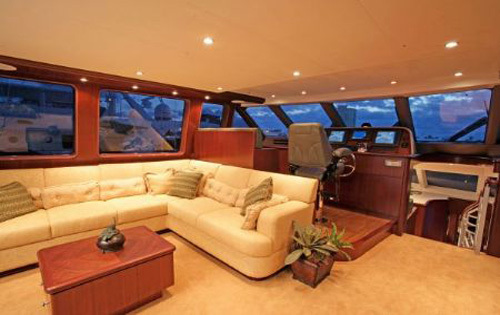 In this main deck salon area there is a beautiful atmosphere thanks to the lighting and a 52”Flat screen TV. A Staircase leads down to staterooms and there is a day head in the forward companionway to starboard. 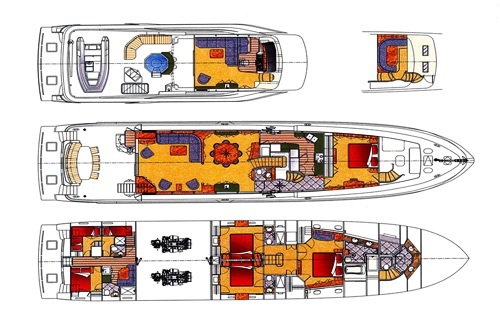 On the level above, motor yacht CHRISTINE II boasts a lovely Sky lounge with a raised U-shaped dinette settee with table where it is possible to watch the Captain at work. 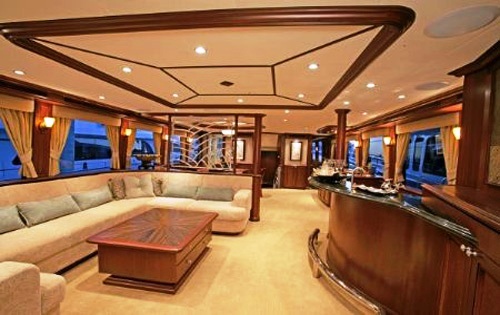 The Pilot House on the main deck also has an L-Shaped Settee with cocktail table and a 40” TV. 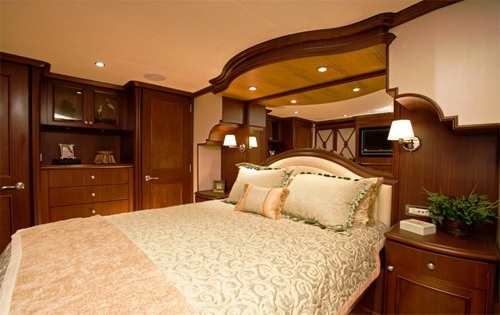 Motor yacht CHRISTINE II is able to accommodate up to 8 guests in 4 cabins including a Master Stateroom on the main deck with a King bed with storage drawers, two cedar-lined closets, one with a safe, vanity desk with storage, a 32” TV, VHF Radio. There is a step down to the master ensuite which has two sinks, shower and a separate tub. There is an overhead skylight in the ensuite. The VIP Stateroom is located on the lower deck forward and there are 2 double bedded cabins located amidships on the lower deck, each with their own ensuite bathrooms. 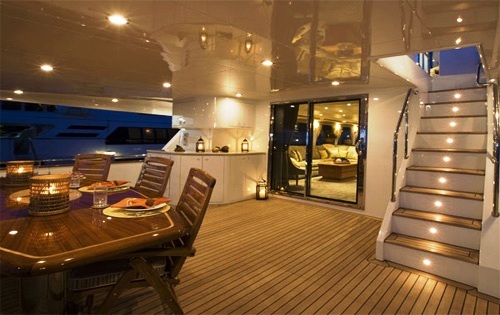 Luxury charter yacht CHRISTINE II has great external areas with an Aft Deck that is covered and shaded, with a beautiful teak table that can seat 8 guests from al fresco dining. There is also a refrigerator and ice-maker on hand for cool drinks to be served. There are gates at swim platform stairs and twin staircases to the swim platform that features underwater lights that surround the hull that are illuminated at night. The sundeck on motor yacht CHRISTINE II features a custom 4 person Spa Pool incorporating a bar with 4 stools along the Spa Pool. 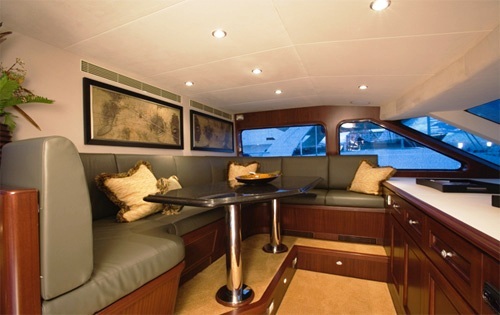 An L-Shaped settee to the port side is covered and there is a BBQ Grill and sink so the chef can prepare a classic casual BBQ before your eyes. In summary, she's a great example of Cheoy Lee’s popular Bravo 100 Series, and offers speeds of up to 20 knots combined with the oceangoing stability and seaworthiness the builder is known for – a perfect mix for exploring the coast of Florida and the Bahamas. 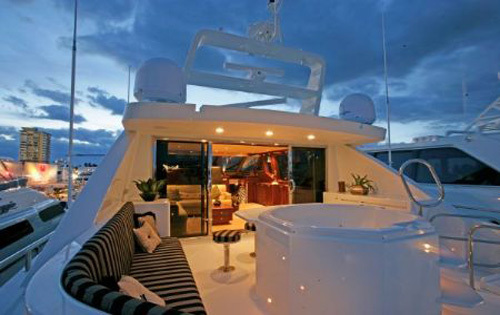 The yacht is topped by an observation deck that makes an ideal spot to enjoy a cocktail or meal while underway, surrounded by panoramic views. Blessed with abundant inviting public spaces, CHRISTINE II also features a sky lounge on the bridge deck, a spacious sundeck with a bar and Jacuzzi, and an elegant salon with formal dining table for eight guests. The aft deck offers another, more casual dining option. M/Y CHRISTINE II has the following selection of Tenders, Toys and amenities: A 28’ Rabalo Center Console with twin 250’s, an 18’ Tender, Snorkel Gear and Fishing Gear. Communications include a Satellite phon, Satellite TV, Panasonic Phone System, 2 VHF Radios, 6 Handheld VHF Radios.